And the ball bounced back. No matter where I hit it on the dusty cement court inside an empty gym on an idle Saturday in Rosario, Argentina, prepping for two big South American tournaments ahead, the ball came back to me. And that familiar bounce, the return of something expected, it brought cadence to my afternoon, carried a certain cathartic rhythm to a day that otherwise was drifting sideways, standing still. In a place far away, dealing with the sudden loss of such a special person - a bright light and a mentor, a role model in every sense - that bounce of the ball coming back felt good. At that moment there was everywhere else in the world I'd rather be and nowhere else in the world I'd rather be than on the court, this thump of the bounce repeating again and again on cue. True and dependable, constant and strong and calming. So I kept hitting, thinking, the ball bouncing around the walls. I had learned from my last visit to South America that very little goes as planned here. So when my Argentine squash buddies pitched the "share a car and drive a few hours up the road" idea for travelling from our small city and toward a smaller one for the first tournament, I wasn't all too surprised that the literal translation of couple hour car ride came out to "Mike takes a ten-hour solo bus journey onboard the dusty but faithful Rio Uruguay bus line, sans wifi and any other English language speakers" as the creaking double decker hummed along one lane roads across the sleepy farms and rural huts of northeast Argentina, headed, eventually, for the northern town of Resistencia. If anyone knows the mayor of Resistencia, Argentina, please tell him that a sign saying "Welcome to Resistencia", or "Resistencia" or even just a simple "you're where you're supposed to be" would be a welcomed addition to the city's untitled bus station. The dust settled (literally) as Rio Uruguay crawled to a stop late Sunday night as I finally stumbled off. After failing to find signs that this indeed was my destination, I gave up. Bought a yogurt from the kiosk man and crossed my fingers. Fifteen minutes later I recognized the racquet label on the jacket of a guy a bit younger than me, as he wandered by in a way that made you feel he was looking for wildly lost squash players. Miguel was the son of Juan Carlos, the organizer of the Resistencia tournament, and he was indeed looking for me, along with four other players who arrived moments later - Albert, a top Canadian, Nico, the Paraguayan #1, and Todd, the American #1. It was the first time that I've been in an overseas pro tournament with another American, and our national champion was treated to a royal greeting when Miguel asked if he didn't mind hopping in the truck bed with the Canadian so we could fit everyone in. Back home I thought of Todd as a point of optimism for the sport and its future- to Miguel in Resistencia he was another guy in a crowded pickup. From the back came a quiet murmur from our national champion, "Be careful with the turns!" and I recrossed my fingers on Todd's behalf as we sped across the dirt parking lot for wherever we were going, from wherever we were. My roommate in Resistencia was a twenty-two year old Argentine player named Felix, who took a thirty-hour bus from Mendoza to get to the tournament and didn't speak much English. I soon found myself as the fifth amigo of Felix's wolfpack, along with his friends Nacho and Nahu, and Nahu's dad Daniel. Daniel is a squash nut and an avid masters level player and tournament organizer and I told him through a translator that he really ought to meet my dad. I would face off against Felix in the first round of qualifying and pulled out a solid win in straight games, feeling good about the past month of buildup from Andorra and England. I lost the following night to Diego Gobbi, a 19 year-old rising stud from Sao Paolo who put relentless pace and pressure on the ball, busting a hole in my budding confidence from the night prior. Topping it off was the last of three consecutive freak racquet breaks that left me borrowing one from Diego before Dunlop pulled heroics in shipping me more gear soon after. 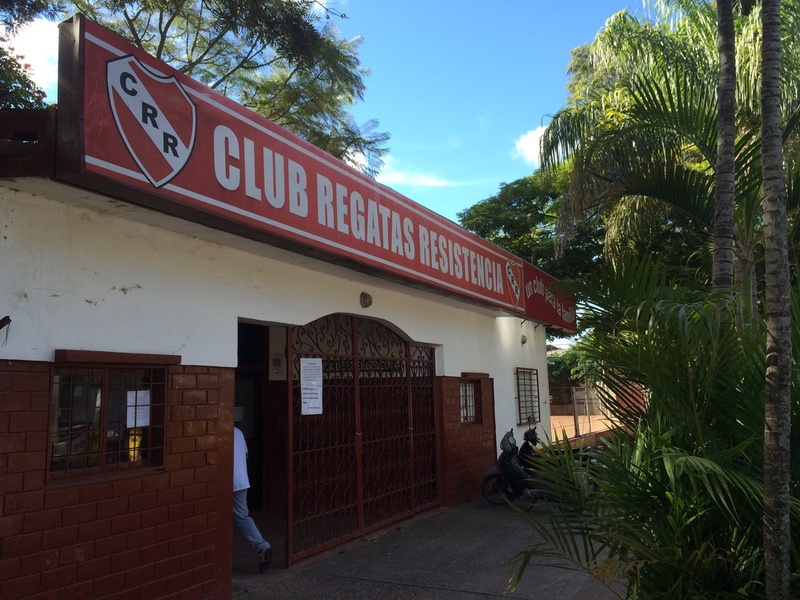 The Regatas Club in downtown Resistencia is a family sports club with kids and games and fields and courts everywhere- basketball and rugby, field hockey and soccer, swimming, with a few squash courts sandwiched in between it all. Our wolfpack of five amigos dodged pickups and horse drawn carts with senor's selling produce as we pulled into the club each night. Entering the squash courts meant weaving through field hockey practice in the sandlot and pickup youth basketball on the asphalt, blurs of bodies and flying balls and playful shrieks in Spanish. Tiny jerseys of NBA great and Argentine native Manu Ginobli danced across the pavement toward the hoop as the last glowing strokes of orange painted the sky before quietly fading into darkness. As foreign as the scene seemed in what can only be described as truly the middle of nowhere, Argentina, it also was strangely comfortable. Different language but the same shrieks and sports and kids and laughs from what I remember. Following Resistencia was another four hour bus trip up the road into neighboring Paraguay for the second and final $10,000 event, The Paraguay Open. Things were going too smoothly by South America standards as our new bus operator, El Pulqui, stumbled into the concrete slab that is the immigration center at the border between northeast Argentina and southeast Paraguay. Only grass, mud and cows for miles as I piled out of the musty back seats with my friend Alex, a younger English player and my roommate from the Malaysia tournament. We followed others to the single window to stamp our exit from Argentina. Standing in line, we watched in brief horror as El Pulqui pulled away out of sight, only to emerge minutes later in a mud pit that must have been the bus waiting zone, next to a wandering cow. Phew, close one. Wouldn't want to be stuck here. Officially stamped out of Argentina, we shuffled around the corner to the single window stamping entry to Paraguay. We waited as the cow wandered in the bus waiting area mud pit behind us. Five minutes of rapid page flipping of my passport and a lot of Spanish with his colleague later, the Paraguayan immigration officer said those two words you never want to be on the other end of: "no visa." We stared at each other. Silence. I didn't know what to say. I had been told there was no prior visa application required to enter Paraguay, but apparently for US citizens, that rule recently changed. And you couldn't get one by bus at the border. And so now I was, technically, stamped out of Argentina and illegally standing in Paraguay. Before I could try my first set of hand gestures to try and explain things, a savior appeared, in the form of a friendly English-speaking Paraguayan doctor named Albert, who grew in Miami and now happened to be standing behind me in line. With a smile Albert explained the situation in Spanish to the understably confused staff of immigration officers. "Why Paraguay?" they asked through Albert. "I was invited to play squash..." I replied, doing my best motion of a forehand as I stood awkwardly in the doorway of the decrepit immigration center. A few more quick questions, answers and mediocre hand gestures later and I had a temporary visa in hand, ready to enter Paraguay. Apparently this happens quite a bit, Albert said, but good thing I was invited to go play squash- they wouldn't want to interfere with an international event. Right. I treated Albert and his nephew to road side bon bons as the other passengers of the El Pulqui cheered our arrival back on the musty bus, and we sputtered onwards into Paraguay. Inside the border I found refuge in the home of Tommy Burt, a Paraguayan my age who worked for the wife of a friend of a friend of my cousin's husband, and who, given his love for American pro sports, the '90s and big random ideas, became a fast friend. Tommy was awaiting his final Masters thesis grades - a crucial piece to his upcoming PhD applications - and his mom was preparing to leave for two months of overseas travel when they both paused their lives and opened up their world to me and Alex for a week in Asuncìon. Grandma next door, first cousins down the street- the immediate family took up the entire block and we became extensions of that. Home cooked meals, movie nights, ice cream in the freezer, NBA playoff chatter, sofa sitting and Sunday morning sleep ins- we were made to feel at home by the little things somewhere south of Bolivia. The Paraguay Open was held at the Internacional de Tenis, a sprawling upper crust country club that also had two open aired squash courts. Like Resistencia, I was seeded to win my first match but lose the next, which would leave me one win out of making the main draw in the Open. I have said this before but I'm now convinced the absolute hardest part of the sport at this level is the mental aspect- the exercise of expecting to win rather than to approach a game simply happy to be there. I felt the pit in my stomach to win the first round, which I did in taking out a top Paraguayan junior player, but really, really wanted to take the next step, and in this instance it meant to win the next match, the one I wasn't expected to win, and advance from qualifying. Just like in Resistencia against Felix, in Asuncion I was slotted to again square off against my roommate, Alex- my training partner, travel buddy and friend. It was now the final round of qualifying, and at 10 PM as the last match on, I came out firing. The points were long and tiring, the ball raced around the walls with extra speed in the sweaty South American heat, and I was set on finding a way to advance, to push through the ceiling. I was fortunate to put all the pieces together and pulled out a strong win in three, punching a ticket to the main draw, the real show, the round of 16. The next morning I pan fried the last of the yucca and scrambled it together with fried eggs and whatever else was left in the fridge for my now go-to breakfast, before taking the court with the world #72 and Dutch #2, Piedro Schwierzman. The video of the match shows I was playing squash but it didn't quite feel like it- Piedro was at a different level and punished me on every loose length, high drop, narrow crosscourt that I would hit. I was knocked out hard in three, but was playing on the third day of the tournament, in the real deal with the big dogs. Even with the resounding loss, I felt a little more like I belonged. Less than a week later a world away in New Hampshire, I sat next to my dad on a row of empty bleachers outside the courts I played on in college. The next day I would serve as the officiant of my sisters wedding, having been ordained a minister at her request via an internet connection and an iPhone a few months earlier. Two days after the wedding, the new world rankings would award my Paraguay performance by slipping me into my long held goal of the top 200 for the first time ever. I would come in at exactly #200. In the stillness of the empty gym I laced my shoes as my dad looked on, grabbed a worn ball and stepped on court in the silence. Lights flickered on above. The first forehand strokes sent the ball crashing into the front wall, breaking the dark silence as the familiar thumping echoed across the hollow building. Things were the same, things were changing. I hit the ball, and the ball bounced back.